Hunt around on the internet, and one will find countless lists that rank Hammer horror films. 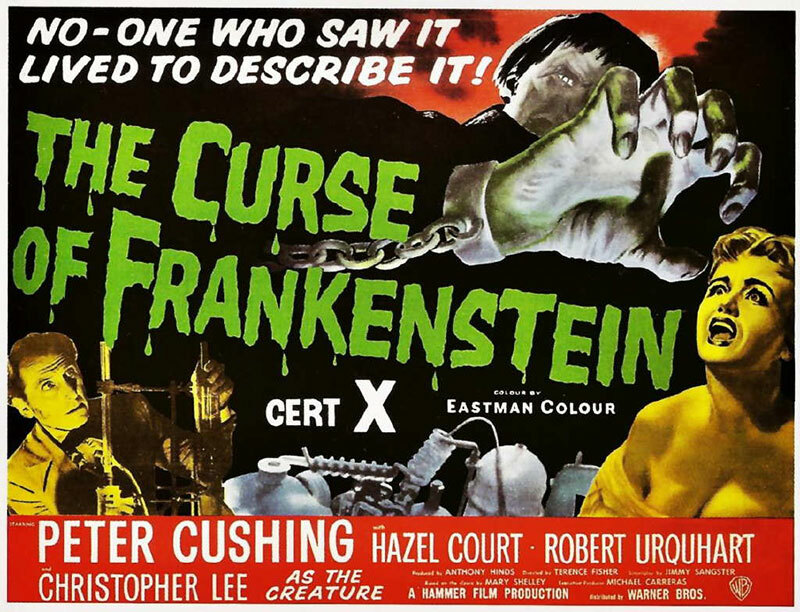 From James Rolfe to random users on reddit, the consensus pick for best Hammer horror film is today’s film, The Curse of Frankenstein. All the elements that make it the quintessential Hammer flick are there. It was written by Jimmy Sangster, directed by Terence Fisher, and stars Peter Cushing and Christopher Lee. Hammer horror doesn’t get more ‘Hammery’ than that. Taking place in the early 19th century, The Curse of Frankenstein follows Peter Cushing as he plays Victor Frankenstein. When we first see Victor, things aren’t going all that well for him. He’s in a cold prison cell, awaiting execution for crimes that we viewers have yet to see. He calls for a priest, but rather than seeking absolution, Victor is pleading his case one last time. The movie, then, is his story told in flashback. Victor is a baron, part of the hereditary noble classes of Europe. Viewers can assume that means he has large land holdings and lots of money. We see none of it, but that’s okay. Simply calling Victor Frankenstein a baron is enough to explain the big old house he lives in, and you can’t have gothic horror without a big old house. When Victor is younger (and played by Melvyn Hayes), he hires a tutor to come and live with him. Paul Krempe (Robert Urquhart) continues to stay with Victor after his studies are complete, and the two begin experiments on reanimating dead flesh. Paul is the practical one of the pair. When he sees what the two of them have accomplished he thinks how it can be applied to surgery, to saving lives. Victor, on the other hand, has grander ambitions. Rather than creating a state of suspended animation in the living, Victor wants to use their discoveries to create a brand new living being. He wants to be a creator of life, in a way that man could never be. The prospect horrifies Paul, and the two come into conflict. Victor is obsessed with the idea of creating a man. His enthusiasm and naïveté take on a dark turn as he gathers the body parts necessary for his creation. It is only a matter of time before he crosses a line, when simply waiting for the parts he needs to become available is not enough. Some would say that building a person and imbuing it with artificial life is inherently evil. Maybe so. Killing people to hasten the process, however, is evil, pure and simple. In the pursuit of his dream, Victor becomes a monster. And we haven’t even seen the creature yet. Victor does succeed in creating a patchwork man, and it is a disturbing creation, indeed. Christopher Lee doesn’t have a single line in this film. He spends his screen time slathered in some rather disgusting makeup (and a bad Buddy Rich wig) wandering around confused. It couldn’t have been an easy role to perform. It’s a 100% physical performance, and Lee does a fine job of conveying the base, infantile emotions one would expect from a newly birthed creature. The creature isn’t as important to this story as Victor. Other portrayals of the character have shown him to be possessed by his discoveries. But there is always a denouement where Victor is horrified at what he has done. Not so here. Cushing’s Victor is a bad man, and not just driven. Murderer, philanderer, possibly a sociopath. Victor is more monster than the poor thing he creates. Unlike in the source material, where the creature flees from Frankenstein the day it is created, Victor holds on to his creation in this film, holding it captive to torture and experiment upon further. There’s far more arrogance and evil to Cushing’s Frankenstein than in other performances. This movie is engaging in a way Hammer’s Dracula was not. Maybe that’s because it’s not a condensed version of the source material, but a new story, with only the most substantial threads of the original still intact. Apparently Hammer had to tread lightly with this production in order to avoid legal action from Universal Studios, which had produced the Boris Karloff Frankenstein movies. Either way, this film has a wonderful flow to it that is all its own. All those writers and internet provocateurs that got around to Hammer horror films before Missile Test are right. I haven’t seen a lot of Hammer flicks, but The Curse of Frankenstein is the best of what I have seen.